New Zealanders love their gardens, and to celebrate one of our favourite pastimes New Zealand Post created a series of stamps featuring six flowers that were bred locally. 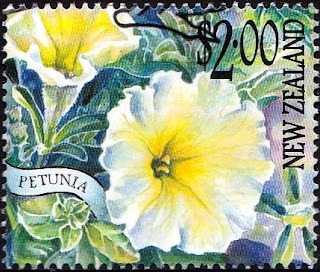 Three were local and international award winners – one named specifically for the International Year of Volunteers, one being the first in the world to produce this colour combination, and one for being the first yellow perennial petunia in the world. I love bright flowers and have planted many so I can grow them myself. I think to see some flowers as you walk past lightens the soul too. I have vegetables growing in the big garden and around the house are little gardens where I keep my flower plants. I went into the garden shop and asked the man for plants of many colours and all seasons. This is what I have and can enjoy. I try to spend some time each week, weeding, tending and caring for them. Each of the flowers selected in this vibrant collection was either an award winner or held some special significance for New Zealanders. 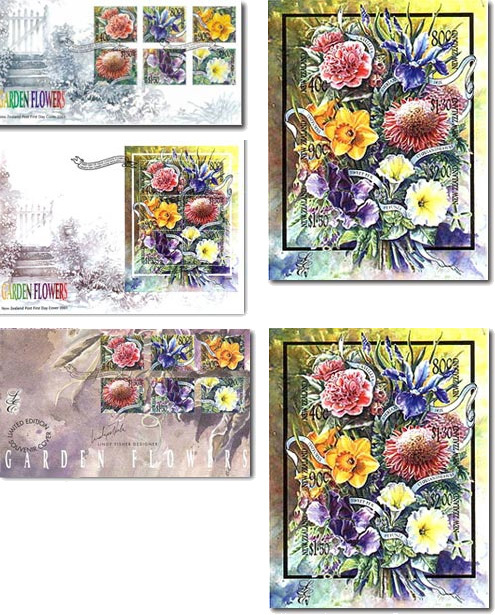 To create the individual stamps one beautiful overall image forming a bouquet was produced, which can be fully appreciated through the miniature sheet. As an issue, they presented an overall effect of visual delight, while as individual stamps they invited appreciation of the finer detail. 40c - Camellia 'Volunteer' - (used). 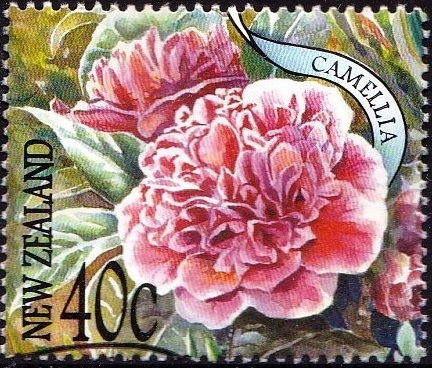 Just one of the 420 varieties of camellias raised in New Zealand. Camellias have been grown here for over 100 years. The ‘Volunteer’ was named specifically for the International Year of Volunteers and was released in June 2001. 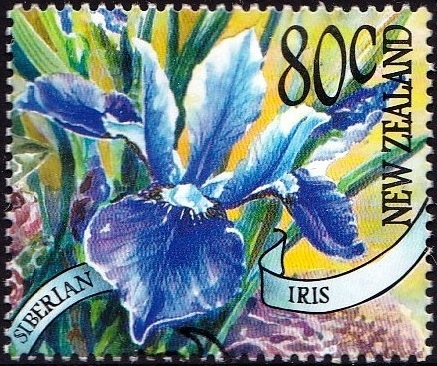 80c - Siberian Iris 'Emma Ripeka' - (used). A beardless iris native to Europe and Asia and one of the water-loving iris. 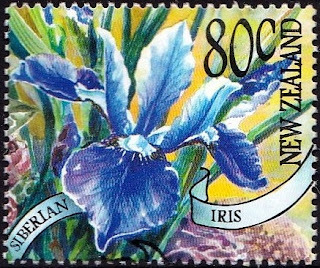 Emma Ripeka won the 1994 Dykes medal – the highest award for iris cultivators in the world. 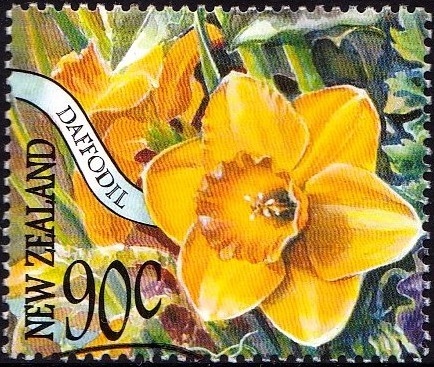 90c - Daffodil 'Demand' - (used). 'Demand' was awarded the highest honour in 1991 that can be given to a new variety, a First Class Certificate. Daffodils hold a special place in New Zealand hearts, with Daffodil Day being the name of the Cancer Society’s popular fund-raising and awareness event. 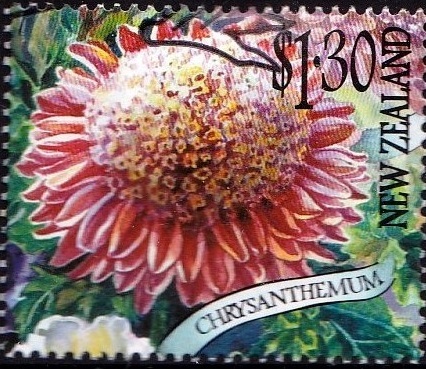 $1.30 - Chrysanthemum 'Edith Mechen' - (used). ‘Edith Mechen’ surpasses any other cultivar in any classification or section as an all-time Champion in New Zealand at National Show level. Chrysanthemums originated in China and their cultivation dates back to at least 500 B.C. 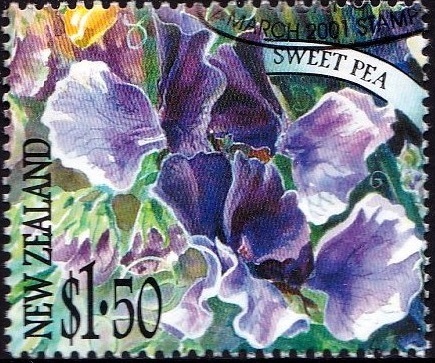 $1.50 - Sweet Pea 'North Shore' - (used). ‘North Shore’ is unique in the world with its navy blue and violet petals, and winner of Royal Horticultural Society awards. Originally natives of Sicily, the flowers are relatively small with stunningly vibrant colours and a strong exquisite fragrance. $2.00 - Petunia 'Moonlight' - (used). 'Moonlight' is the first commercially available vegetative yellow petunia to have been bred anywhere in the world. The petunia originated in South America and is a hybrid plant which has been cultivated for about 175 years. 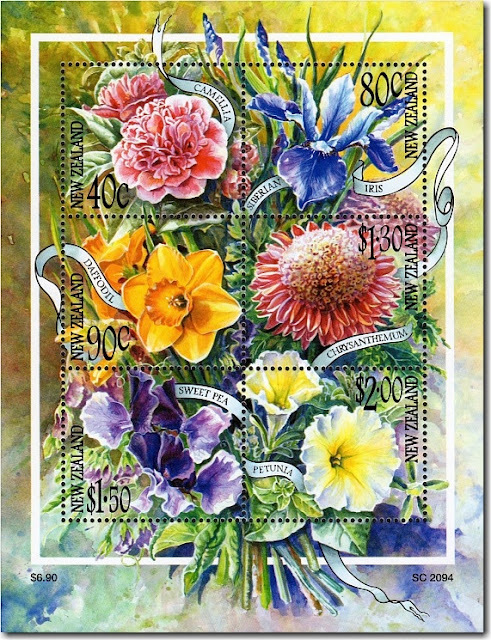 The miniature sheet with all six stamps. I love the way they have designed this like it is a bunch of flowers. Some of the collector Items. I will replace these if we find better images. On Left Side: First Day Cover; Miniature Sheet First Day Cover; Special Edition First Day Cover. On Right Side: Two miniature sheets. 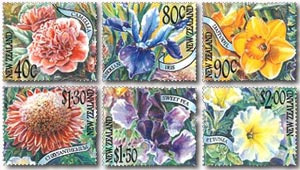 These stamps remained on sale until 6 March 2002.